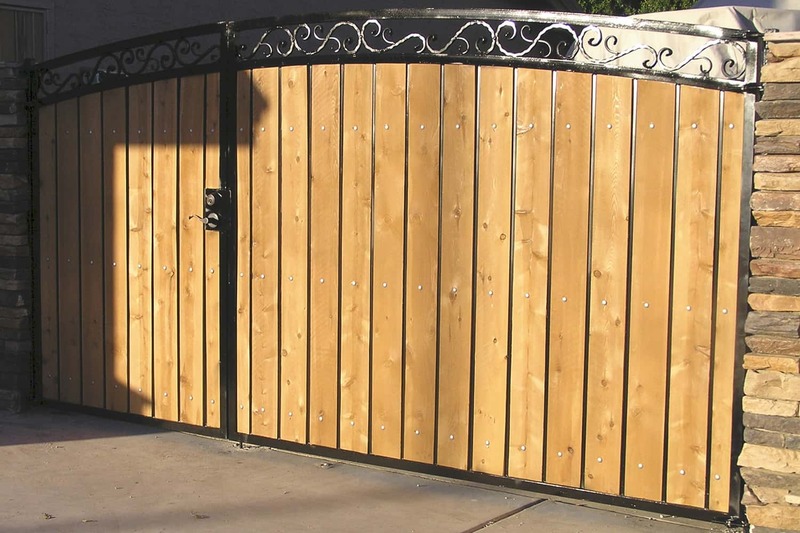 Decorative straight top RV gate. See this beautiful 3-rail decorative RV gate with the hand-hammered Italian scrolls in the top section providing the decorative detailing. The rustic cedar composite privacy slats provide privacy while the rubbed bronze deadbolt and handle provide the security. With our dark brown polyurethane electrostatic paint applied over an epoxy primer, the finish weathers our intense sun. 31' wide opening RV gate. 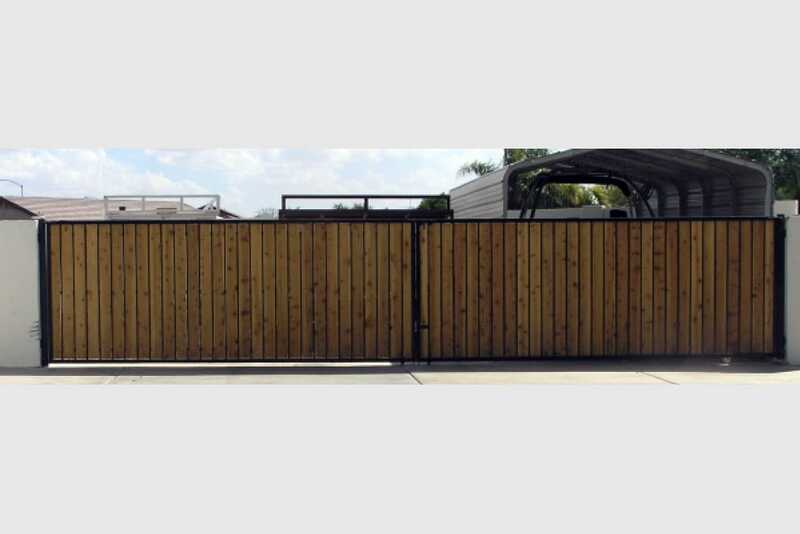 This large, wide RV gate spans a 31′ opening. All the hardware and frame were oversized to provide a secure, easy to use gate. Arched decorative pedestrian gate with kickplate. To extend the height of this gate and to help keep out unwanted desert critters, we installed a 6" tall kickplate in the arched pedestrian gate. The wall is tall and we were able to build up the gate to arch in proportion with the height of the wall. Arched decorative RV with C scrolls intop. A different look with the arched decorative gate and using C scrolls in the top of the gate for the additional decorative look. Commercial use of an iron and wood RV gate. This slide gate protects the parking area of a company with a handy to use slide/rolling gate. Arched decorative pedestrian gate with light cedar stain. 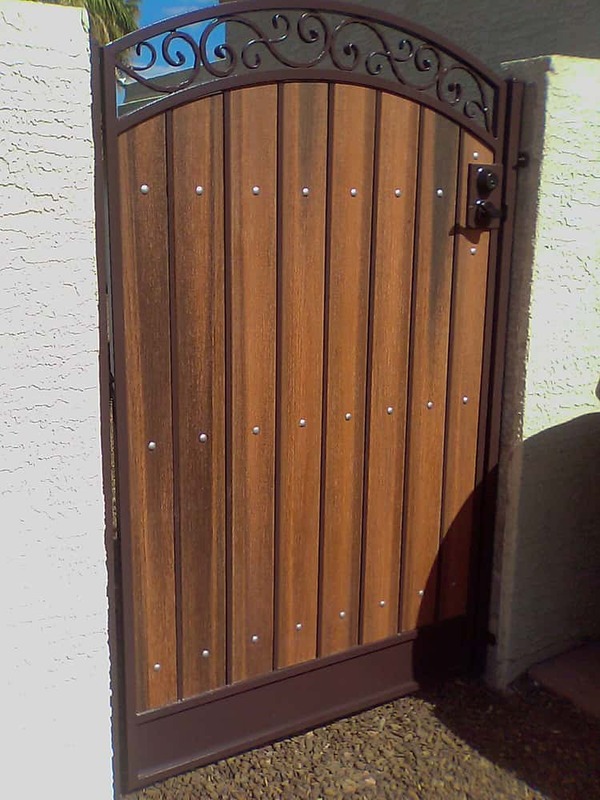 This pedestrian gate matches the RV gate with the arched decorative gate and light cedar stained and sealed wood. It is secured with a matching deadbolt and handle for ease of working around the yard. Arched decorative RV gate with black steel and light cedar wood. 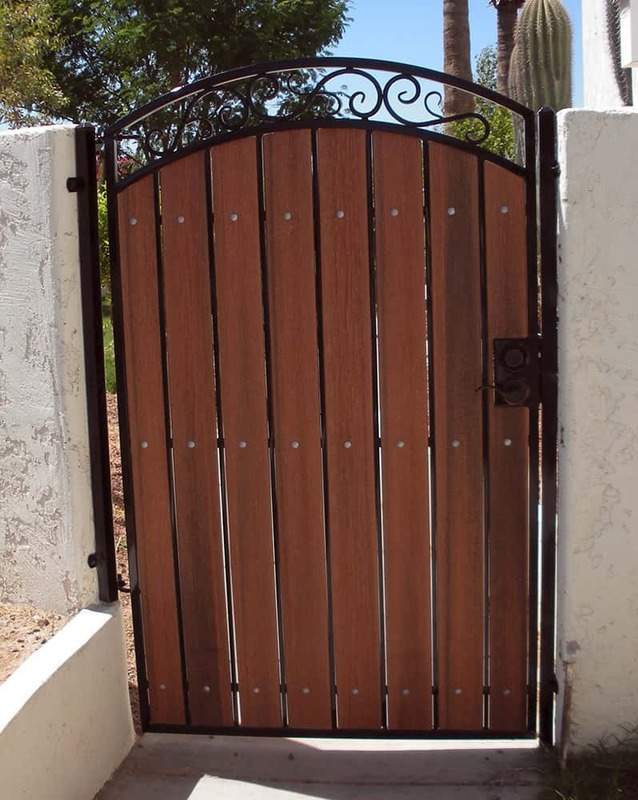 This beautiful arched RV gate combines black polyurethane paint on the steel with light cedar stained and sealed wood for a beautiful combination. This 12' gate also uses the uneven split with the handy 4' pedestrian gate side. Decorative arched gate with the natural cedar composite privacy. Arched pedestrian gate showing redwood composite and black steel. Another color combination is to use the redwood composite with the black steel frame and pickets. 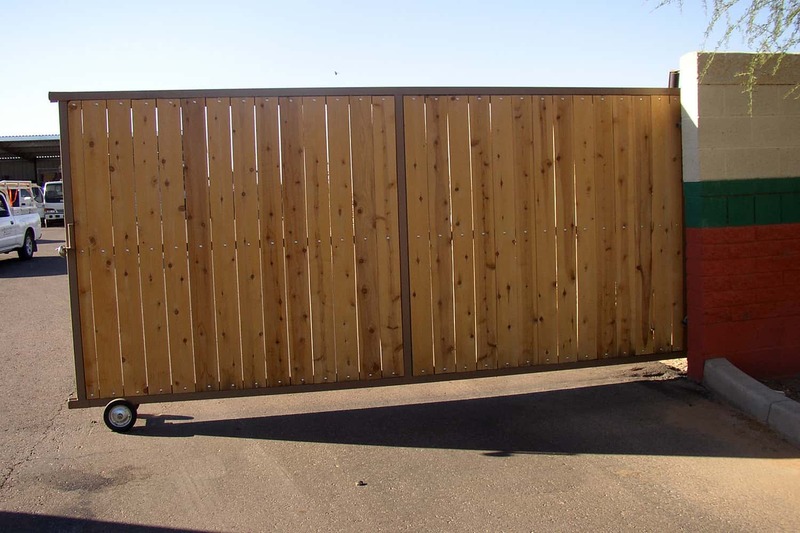 Decorative RV gate with dark brown frame and rustic cedar composite privacy slats. This arched decorative RV gate combines the beauty of the hand-hammered Italian scroll work in the arched portion of the gate with the privacy of the rustic cedar composite slats. The dark brown polyurethane paint is applied electrostatically to this gate after an epoxy based primer. 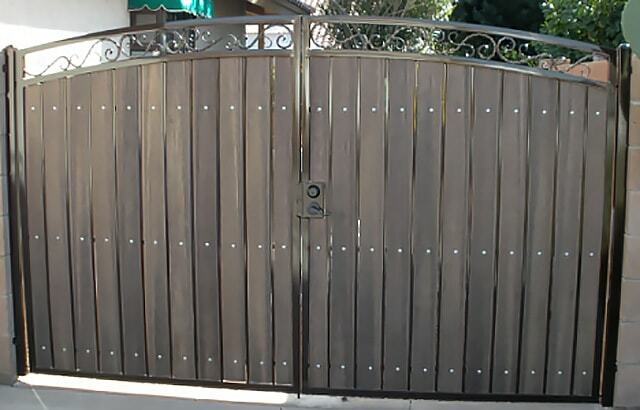 The rubbed bronze deadbolt & handle secure these gates. A different decorative look to this gate. 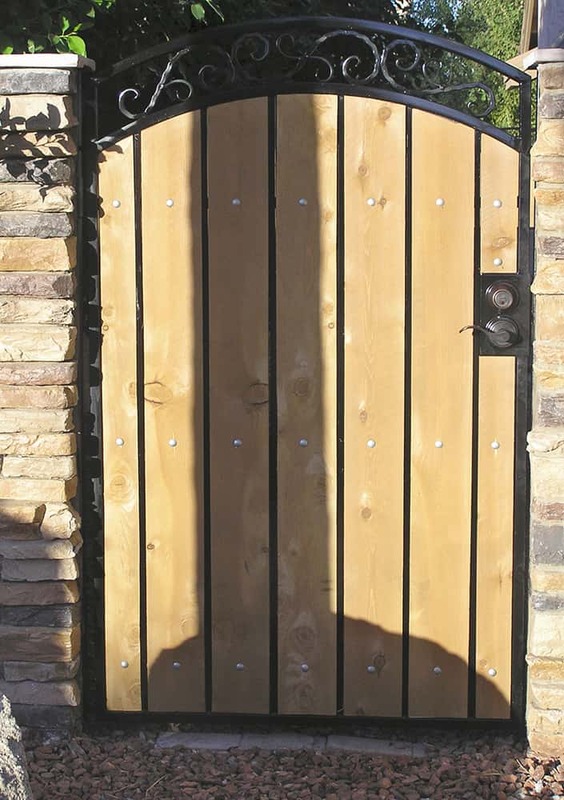 This gate uses in-gate design elements to mimic the look of an antique front door at this house. 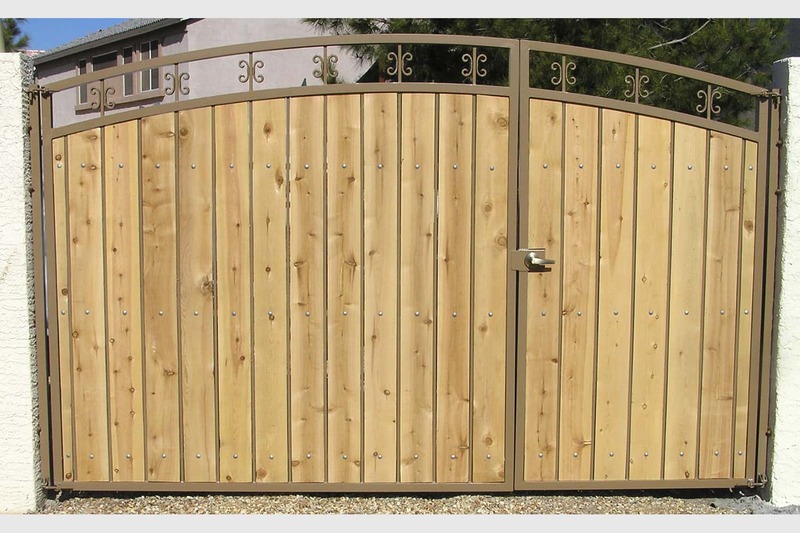 Do you have a design element you would like to see incorporated into a gate design? 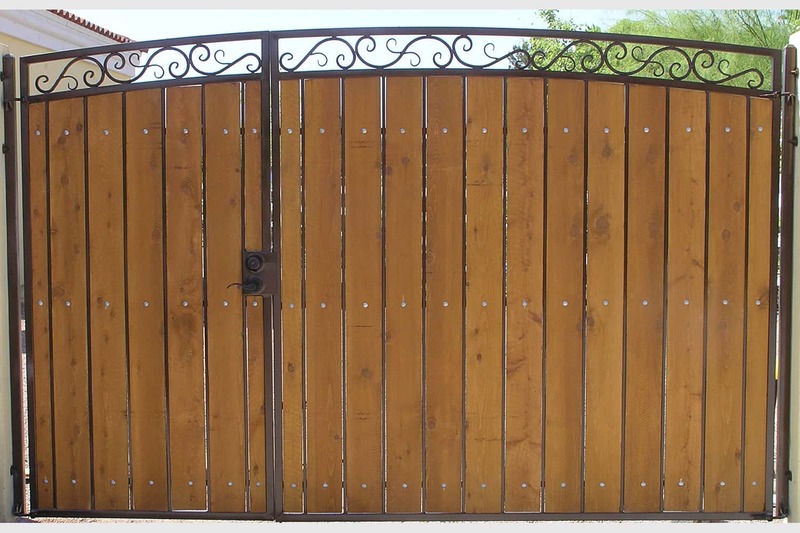 Arched, decorative, secure and useful RV gate. The rust colored polyurethane paint and the redwood composite privacy slats comb. 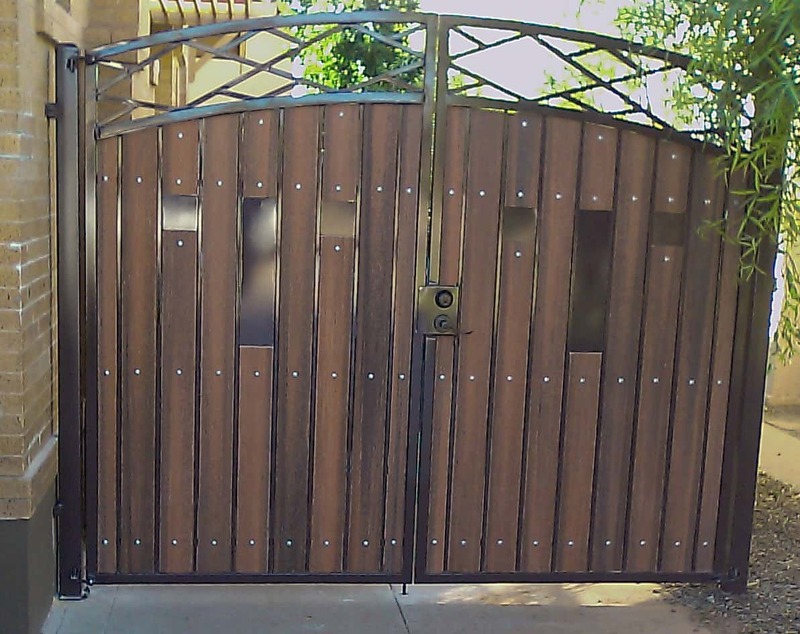 This is our most popular look for decorative and secure RV gates. 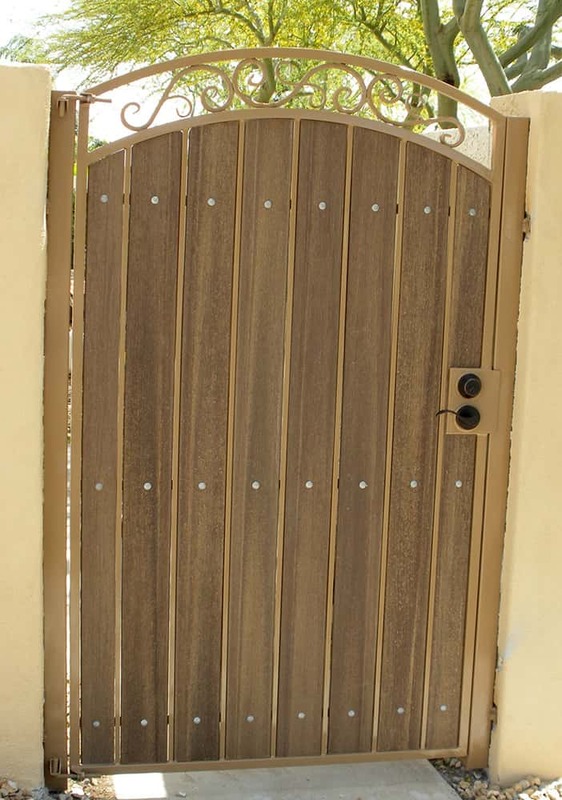 The no-maintenance composite privacy slats give the look of treated wood and the arched frame with our hand-hammered Italian scrolls gives the gate a beautiful outline. 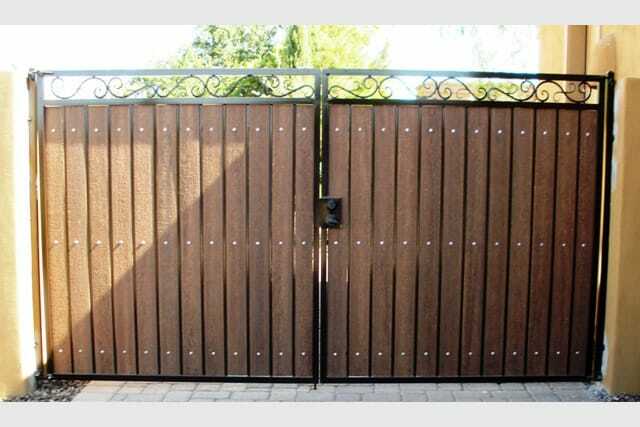 With the larger size materials used in the RV gate and rubbed bronze security hardware with two-sided deadbolt and handle, this gate hangs solidly and securely. 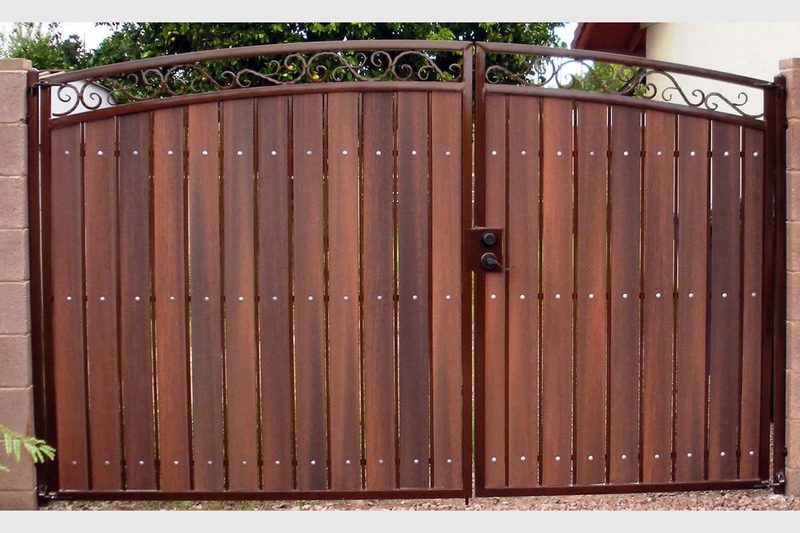 Decorative RV gate with stained and sealed wood.